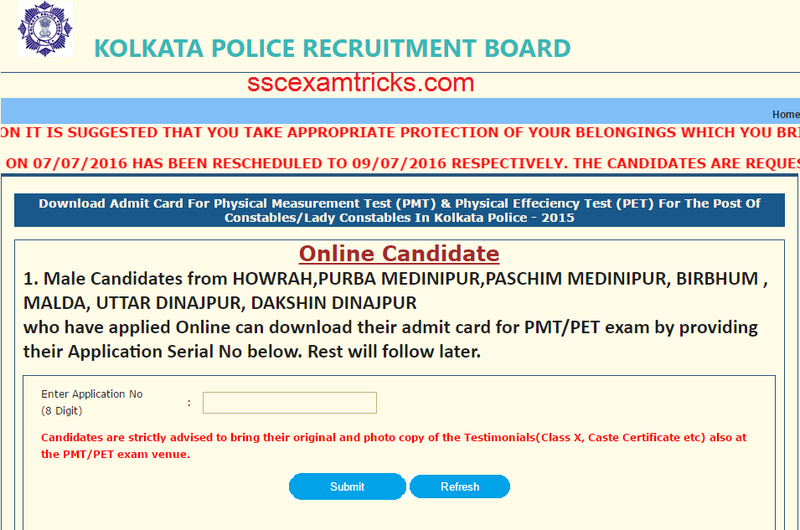 Kolkata Police Admit card 2016 for Constable Physical Test - KPRB PET PMT 2016 Call Letter / Hall Tickets Available on kprb.kolkatapolice.gov.in. 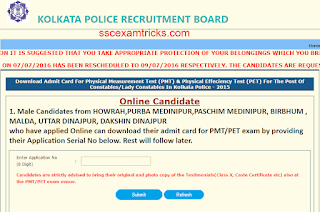 Kolkata Police Recruitment Board (KPRB) is working on uploading Kolkata police admit card for Police constable PET/ PST 2016 which is going to be held in July 2016. The exact date of physical test will be announced very soon on the official website at www.kprb.kolkatapolice.gov.in. The KPRB Police constable Admit card has been available now. Earlier KPRB had invited online applications from 20th November 2015 to 19th December 2015 on official website for recruitment of 1167 posts of Police Constable (Male / Female). The recruitment notification had 1061 vacant posts for Male constables and 106 vacant posts for Female constables. The last date for submit online edited application form was 22nd December 2015. Several lakhs of candidates had applied for these vacant posts. KPRB will complete final selection process in seven stages; Physical Measurement Test (PMT), Physical Endurance Test (PET), Written Test, Personal Interview, Medical test, Document Verification and Training. The successfully applied candidates are waiting for their Kolkata police admit card for PMT/ PET test which will be available through online mode only. No admit card will be sent by post to the shortlisted candidates. Those candidates who have successfully applied / filled online application form and paid their application fee (Rs. 150/- for General/ OBC only) on prescribed bank; they are now looking for Kolkata Police PMT / PET syllabus as well as admit card date. The venue of PMT/ PET will be decided by the board where these eligible candidates will be called with printout of their online admit card and a photo ID proof. Before Physical Measurement Test (PMT), candidate’s Photograph and Finger Print will be verified through webcam/ biometric device. Then these candidates will be eligible for Physical Measurement test will be taken by Digital Measurement Device. First, Height and Weight Measurement will be measured in PMT and then second, Chest Measurement will be measured as per standard given in KPRB Police Constable Recruitment 2015-16. · For Male Constable: Running of 1600 metres in 06 minutes and 30 seconds. · For the post of Lady Constable: Running of 400 metres in 02 minutes. The Timing of individual runner / candidates will be measured by Radio Frequency Identification Device (RFID). The PET qualified candidates will be shortlisted for written test and PMT/ PET will be conducted for qualifying nature only. No marks will be evaluated to the shortlisted candidates called for written test. The best process is discussed here by which you can easily download your Kolkata Police Constable PMT/ PET Admit card 2016. You need to provide your registration detail as application number/ DOB. Submission of correct detailing leads you to open your admit card which contains your name, father name, date, time and venue of PMT/ PET. The direct links are provided here.